In Shadowhunter‘s first season, Simon Lewis found himself thrust into a world of supernatural beings and almost as quickly found himself as one of them. We saw his transformation into a vampire in the first season, but it sounds as if this second season will really be the year we get to really delve into Simon’s being a vampire. But facing a new reality where Downworlders aren’t welcome won’t be the only obstacle Simon faces this season. There’s also an internal struggle that is going to test Simon in season two. Perhaps the most buzzed about aspect of Shadowhunters is the relationship between Magnus and Alec, which fans got a glimpse of in the first season. It was a season that teased the attraction between the two and culminated with a huge, public kiss at a wedding. And it sounds like the magnitude of the moment has finally set in and will have Magnus and Alec asking some important questions. Fans can expect to see much more of the development in Magnus and Alec’s relationship in season two. 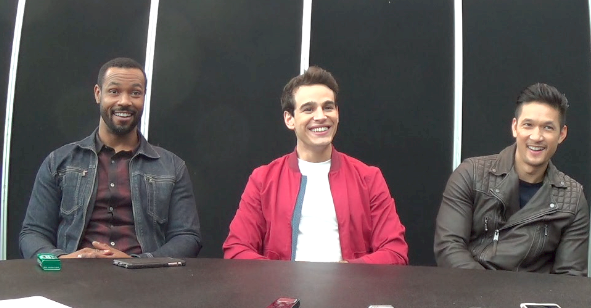 Watch the full interview below where Rosende, Shum Jr., and Mustafa discuss Luke and Jocelyn’s relationship, Clary and Simon’s foray into romance, and more.